This article is the extension of a post I did a while back: the complete guide to Guerlain foundations. The current additions have to do with the liquid foundation of Blanc de Perle and the exclusive corrector/highlighter of the Blanc de Perle range, which are available mainly in the Middle Eastern and Asian markets. Blanc De Perle is Guerlain’s renewed name of a range formerly known as Pearly White. This is a collection of a complete set of skincare and make up products/solutions for skins suffering discoloration, pigmentation and many more. I am able to talk about both, Pearly White and Blanc de Perle and the huge hiatus between them and argue about why cosmetic brands some times do not only change the name on the etiquette, but also what is inside the jar, for better. 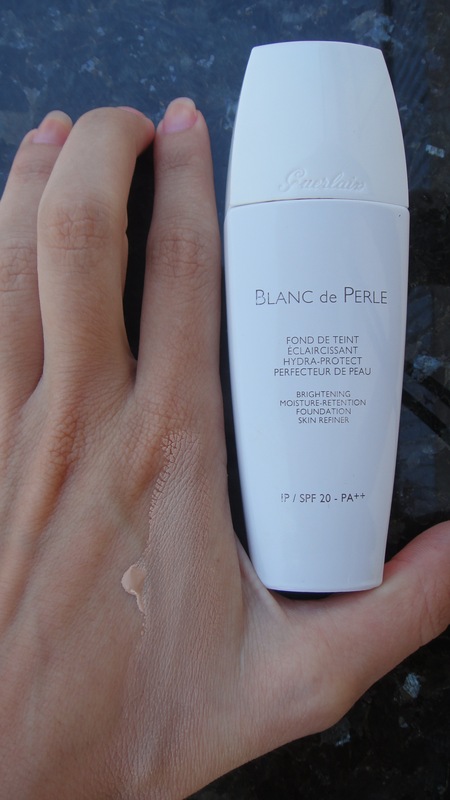 Onto the product itself, the liquid version of Blanc de Perle is a medium to full coverage foundation with a thick, consistent texture. 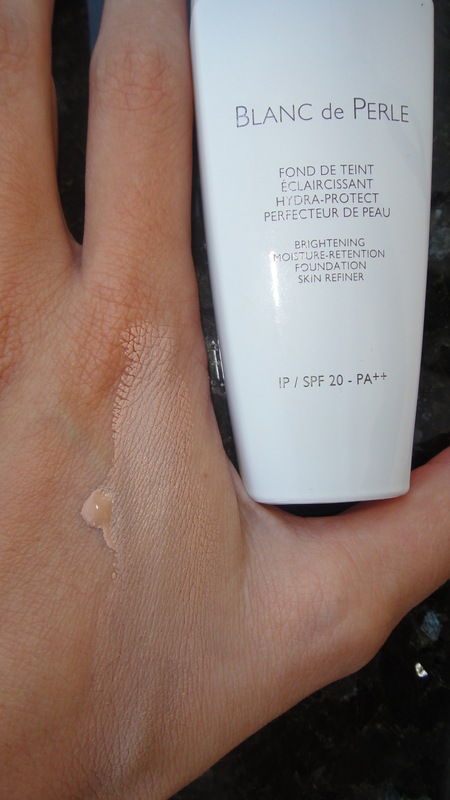 The finish is beautifully matt yet glowy and its longevity is great, even without a single drop of primer. I would suggest this product for oily and for combination skins. If you find your skin particularly oily only in the T-zone, you could apply Blanc de Perle there and choose another foundation, even a shade darker, for the rest of the face. This would not only ensure a matt T-zone, but also a J-Lo make up effect (bronzed out, light and glow in the middle). 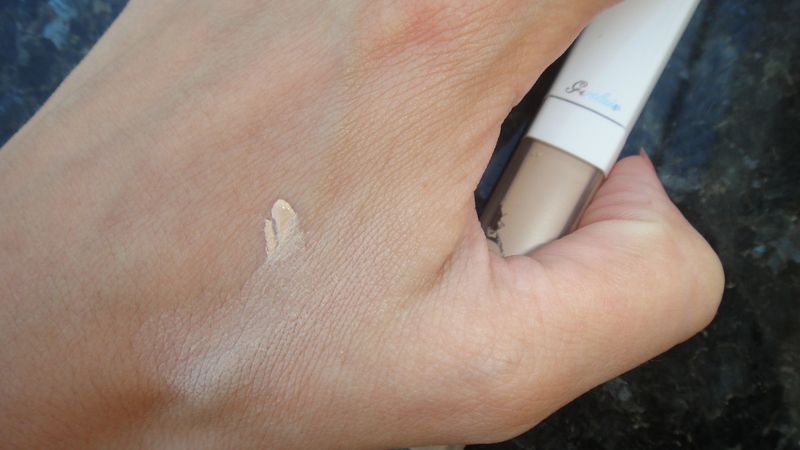 I have noticed that this foundation is best applied with fingers. It comes in 5 shades (01 Beige Pale, 02 Beige Clair, 03 Beige Naturel with beige undertones and 32 Ambre Clair with yellow undertones). It also has an SPF of 20. In the pictures you see Beige Clair 02 on my super tanned hand. 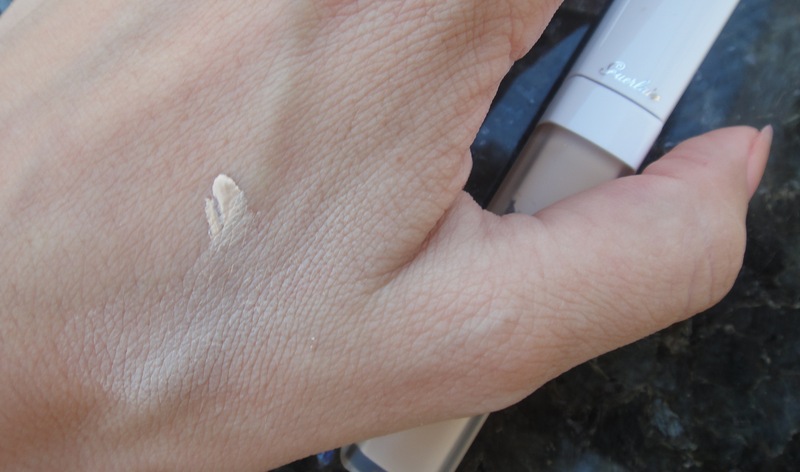 I also want to add that Blanc de Perle foundation is a far better version of Pearly White, as it is more consistent, less runny and it does not leave my skin grey as Pearly White used to do, when I hardly had any sleep the night before. For more information check Guerlain’s website . To check out the compact version of this foundation visit my previous post on Guerlain foundations. This is the highlighting corrector from the Blanc de Perle range and it comes in two shades, 00 with pink undertones and 01 with yellow undertones. In the pictures below you see 01. Very often I think about how this would be a great concealer if only it would come in darker shades, as it has good longevity and nice, workable texture. It has thin to medium, yet buildable coverage and I find it works better over and not under my foundation. It dries matt, complementing amazingly its matching foundations in liquid and compact forms. I like it a lot more than Guerlain’s precious light pen and for me it is an ideal dupe of YSL’s Touche Eclat pen, as it is a little more long lasting than that. The applicator is a wand, which makes it hygienic and easy to use. I like using it as a highlighter and to cover my pigmentation spots in the centre of my face, building it over my foundation. Check it out here. This entry was tagged blanc de perle, corrector, foundation, guerlain, make up, ysl touche eclat. Bookmark the permalink.